Once more, the remarkable presence of percept-studio at the international film festival in Cannes made the buzz and many fellows there will remember that day. 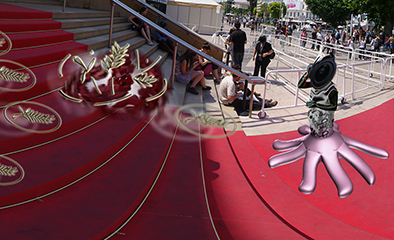 Flash Application of June is an interactive panoramic view showing what happened then on the famous red carpet stairs at Cannes. Some photographs have perceived these stairs in such a way they never have done before. Were there any UFO flying over the red carpet or such objects so much identified as a glorious trophy, namely the golden palms. And all these palms were flying in a burning atmosphere, shining with all there inner fire, setting on fire, even blowing up, breaking out the stairs, tearing up the purple carpet. Some of the photographers seemed to transform themselves as if that new perception had touched the deepest parts of their soul. Huge lens were getting out from their face and their whole body looked like a phenomenal mutant, as if they were such stuffed as a camera, with plastic instead of blood running into their veins, as if their legs and feet were about to be transformed into a tripod, as if they were about to be transformed into a photographic octopus.